Today, we’re going to tell you about Mr. Wolf. He solves problems. Problems such as: your desire to tear down the streets of DC on your bike at 45 mph, coupled with your aversion to Tour de France–style training. 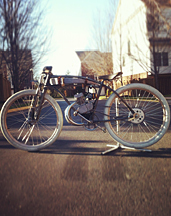 Introducing Wolf Built, a new line of custom bikes out of Virginia, built from vintage parts and souped up with hand-built motors. They’ll be on hand tonight at Redeem’s holiday party. These one-of-a-kind roadsters let you live out your Lance Armstrong and Peter Fonda fantasies all at once. Now, Mr. Wolf goes fast, so try to keep up. You’ll email him and tell him exactly what kind of two-wheeled beauty you had in mind. Then he’ll get to work on a Photoshop mockup of your ride (he’s a graphic designer in addition to being a lifelong builder of hot rods) and start scouring the Internet and antique lots for just the right vintage parts (besides looking cool, the steel was stronger back in the day). Within a few days or a few weeks, you’ll have your totally unique two-wheeler. The coup de grâce: a small, two-stroke engine that can take you anywhere from a 30 mph cruise to a flat-out 45. Putting baseball cards in the spokes is your call.